A woman who beat cancer twice as a little girl has returned to the hospital where she received treatment - this time as a nurse. 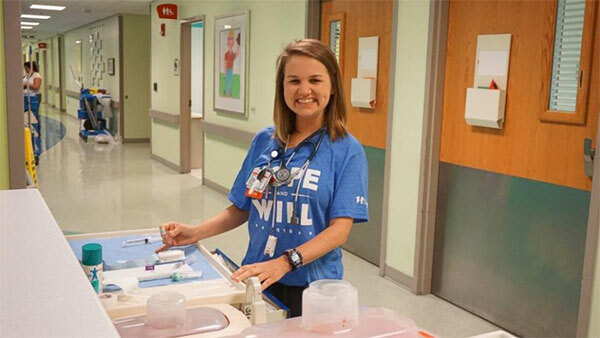 At 17 months old, Amelia Ballard came to Scottish Rite Children's Hospital, now called Children's Healthcare of Atlanta, with a 106-degree fever. She was quickly diagnosed with acute lymphocytic leukemia. Shortly after a 27-month treatment, she relapsed. She explains, "The cancer during my relapse was extremely aggressive and my course of treatment required intense chemotherapy, cranial radiation, total body radiation and a bone marrow transplant." Luckily, her older brother Robbie was a perfect match for the bone marrow transplant, and in June 1997, Amelia received her brother's stem cells. There were some complications, but in the end, the procedure worked. Fast forward to May 2016 when Ballard graduated from Georgia Southern University's nursing program and returned to Children's Healthcare of Atlanta as Amelia Ballard, RN, BSN.